The air is thick with expectation. Chef de cave Dominique Demarville has set in front of us wines from an submarine champagne vault in the Baltic Sea next to duplicates from their Reims cellars. It is midsummer in the Åland islands and time for the first assessment of Veuve Clicquot’s 40-year underwater ageing experiment. I am eager to sense what three years underwater have done to the champagnes but restrain myself to first look at Demarville. The tall, down-to-earth and cordial chef de cave looks at me enthused but also surprisingly relaxed. The primus motor of the experiment is seemingly pleased with first outcomes of the Cellar in the Sea project. But how did he end up here and who is the man behind Veuve Clicquot champagnes? Seven years ago, Demarville received a surprise phone call about a newly discovered 1840s shipwreck containing a champagne treasure. The then fresh chef de cave had only recently stepped into the big winemaking booths of Champagne’s second largest house. Tasting the ancient wines was an emotional moment for Demarville, as the Clicquot bottles dated back to 1839 and Madame Clicquot’s era. In fact, the legendary iron-lady has been such an inspiration to Demarville that he names her as the historic person of he would like to meet should time travel be possible. Therefore it is no surprise that Dominique has lent his motto from Madame Clicquot: ’Only one quality, the finest’. The principle has, in fact, been passed on from chef de caves to chef de caves, with Dominique being the 10th in line since 1772. Where Madame Clicquot was famous for her audacity and business nose, Dominique names determination and curiosity as his most driving characters. As the guardian of the Clicquot style and quality, continuous improvement and innovation are thus Demarville’s means for Clicquot in the increasingly competitive wine world. And certainly he has not stood still in his big boots but taken bold steps for Clicquot. To fine-tune the style, he brought oak vats back into the house resulting in increased precision and complexity for Yellow Label. He mastered the blending for the super vintage 2008, allowing him to start showing his vision for both Veuve Clicquot Vintage and La Grande Dame. The Vintage 2008 has been received with great excitement, which has built up expectations for La Grande Dame foreseeing launch in 2019. Another successful brainchild of Demarville has been the novelty cuvée Extra Brut Extra Old that impressively showcases the rich supply of reserve wines at Clicquot. In my eyes, Dominique Demarville possesses many great assets for a chef de cave. He certainly is a great technician and taster, his never-tiring curiosity allowing him to keep an open mind for technological evolution, climate change, trends and so forth. But perhaps even more important than the aforementioned are his people skills. As the chef de cave of a great house, he has a sizable team to manage, not to mention numerous relations to grape suppliers, partners, journalists and consumers. But luckily Demarville confesses to love people and interaction. 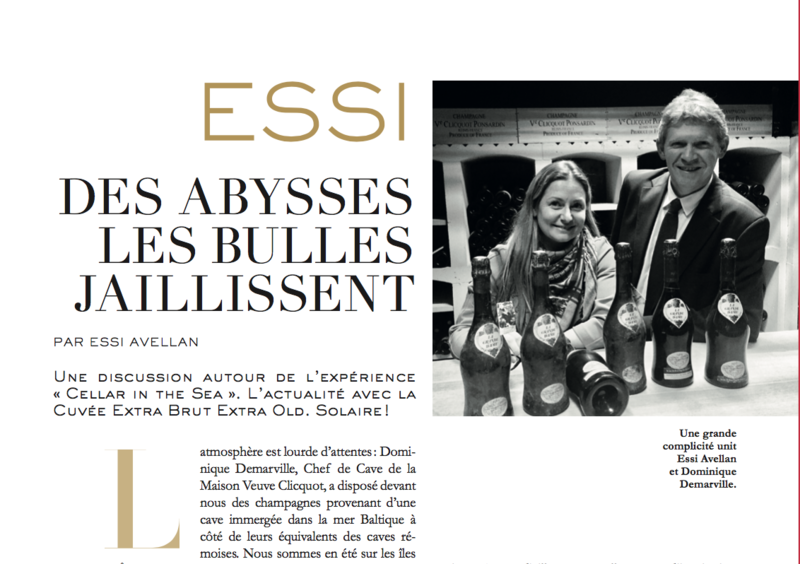 Out of Champagne’s chefs de caves Demarville is actually one of the most open, humble and interested in other people’s views. This we witness first hand in our Cellar in the Sea tasting with Dominique rather listening and asking than speaking out his opinions of the wines. A team player he indeed is, never pushing himself on the forefront. Dominique’s favourite moment of the year is when the labour of the numerous people comes together as creation of the year’s blend of Yellow Label – very much a team effort, he stresses. The master blender and much-appreciated leader has come a long way from being, in his words, a timid but determined child interested in farming. Farming studies soon developed into winemaking when Demarville finished his wine education in Avize and Dijon. Early on his career, he made a great impact during his years as chef de cave at G.H. Mumm and was soon snatched to replace the retiring Jacques Péters at Clicquot. Despite many years’ immersion deep into the champagne world, Dominique has kept an interest for all wines, and is known especially as a Burgundy lover. His farming roots are still visible in his outdoorsy hobbies, which include walks in nature, gardening and fly-fishing. The pleasure given by the last I witnessed on this tasting trip to Finnish archipelago, when Dominique determinedly took on early morning fishing. Returning home with no catch yet sparkling eyes I took as a sign of great passion. 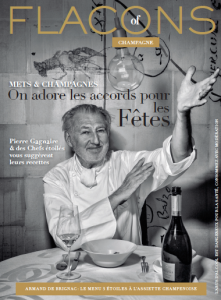 It is the same sparkle I see in his eyes as he savours the wines of the underwater experiment, whose aim is to shed light to how oxygen-free and higher pressure affect the ageing of champagne. ’The differences were in line with what we were expecting, but I am surprised how great the differences were already after three years. This tasting has convinced us to go on with the experiment’, concludes Demarville, whose curiosity is again awakened.